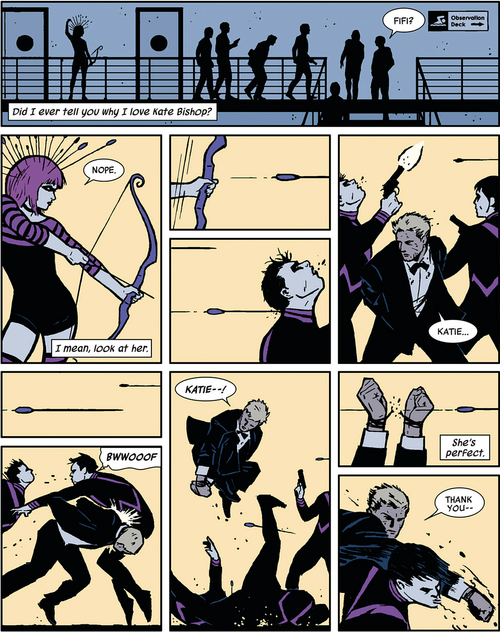 This David Aja page from 2012’s Hawkeye #2 provides a good example of art that, to it’s credit, could never quite be adapted into any other medium. It’s great to not avoid conversations about Captain America with people that don’t have a y chromosome. It’s great that my mom wanted to see The Avengers on mother’s day and that the theater was packed, and that after it was over I could point at the screen and say “That’s what I’ve been so nuts about all my life.” It’s great that kids probably aren’t facing derision at school now for being into Iron Man. It’s great that summer blockbuster movies are now a lot less trite and stupid than they used to be. It’s great that characters from comics are now the center of the entertainment universe and it’s great that Stan Lee lived to see it. It’s great that the filmmakers started to take comics seriously. Now admittedly, the majority of comic books from the last 50 years or so are based firmly in the superhero genre, and that’s what these movies are mining. Even so, there’s countless approaches to that aspect of the art form, and the truly devoted are the connoisseurs. My kind of fan doesn’t have favorite characters– they have favorite creators. So on this site, I’m going to use Back To The Comics as a constant byline. Because we would lose a hell of a lot if we ever lost comics, and it’s going to be important to remember that in the years to come.